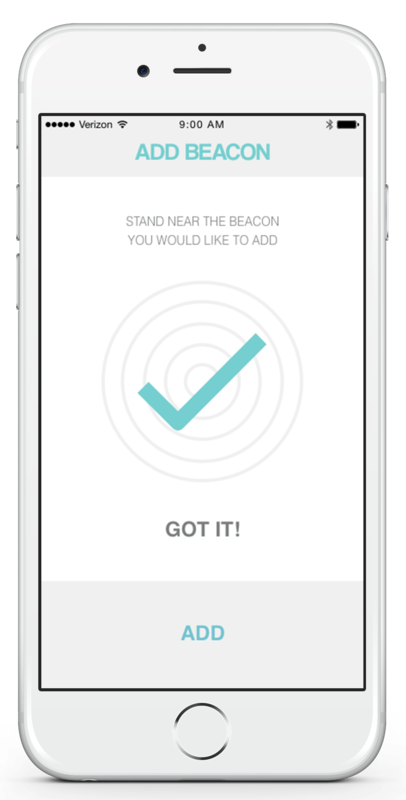 Beacon Action is a new mobile app that triggers actions in your home based on your proximity to a beacon. What’s a beacon? I’ll cover that in the next section. What’s possible? I’ll cover that too. Beacon Action is being developed by Modern Smart Home’s parent company, Flowing Labs, and we think you’ll love it. It’s not finished yet, but we’re looking for smart home enthusiasts who are interested in joining our beta program. Invites will be mailed out in the Modern Smart Home newsletter, so subscribe below or on our newsletter page to get an invite. If you’re not familiar, beacons are devices that emit a Bluetooth low energy (BLE) signal and implement one of the various beacon protocols. They range in size from hockey pucks down to units that fit on a quarter. Most of them are battery powered and run for a year or more thanks to the low energy requirements of BLE. In a nutshell, they just sit there and emit a wireless signal with a unique identifier. They do this constantly until the end of time (or until the battery dies). That’s about it. They’re like digital lighthouses, simply announcing their presence to any devices that are paying attention. For a BLE device to be considered a beacon, it must conform to a beacon protocol. Apple introduced their iBeacon protocol in 2013, which has been adopted by many BLE vendors. Google introduced their own protocol in 2015 called Eddystone, after a famous lighthouse in the UK. Eddystone is open source and supports more data types than iBeacon, but that’s a topic for another day. Ironically, all of the magical things you can do with beacons happen on your phone. Specific apps listen for beacons and when certain beacons are detected, the app can react accordingly. Coming back to the lighthouse analogy, the phone is the ship approaching shore. When the captain of the ship sees the lighthouse, he slows down, prepares for docking, etc. When the app on your phone detects a beacon, it launches an app, sends a push notification, etc. Beacons are commonly used in brick-and-mortar retail stores to push marketing content to customers when they visit specific locations in the store. Some stores push advertisements and special offers to customers when they enter the store. Some stores push more detailed, interactive content about particular products. The goal? Get people to spend more money. Sales and advertising aren’t the only ways beacons are used in retail, but they are the most popular. It’s also possible to hail staff members to your specific location or provide in-store navigation to specific products or departments. There’s a lot of potential. Here at Modern Smart Home, we’re interested in how things like beacons can make our lives at home easier and more enjoyable. That’s where Beacon Action comes in. 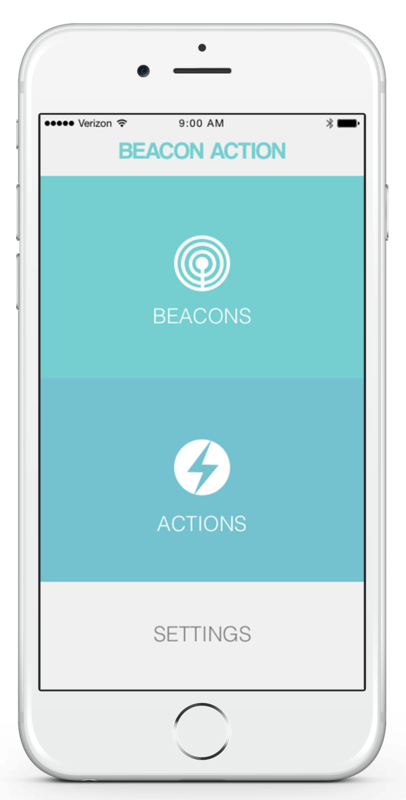 Beacon Action is an app that triggers actions in your home based on your proximity to a beacon. This involves placing beacons strategically throughout your home, configuring each beacon and then defining rules for each area of your home. To get started with Beacon Action, you’ll obviously need some beacons. They aren’t widely available yet, but we’ve been testing with a 3-pack developer kit from Estimote. Using another brand of beacon hardware? Let me know in the comments and I’ll help you get up and running. Once your beacons are placed around your home, use Beacon Action to identify and index them. Walk up to each one and the app will detect it and grab its unique identifier. Give it a friendly name, like Living Room or Kitchen, and save it. Repeat for all of your beacons. Each of these beacons represent a logical region of your home. Every action you create will be associated with a region. Finally, the fun part: actions. Actions are triggered when you enter, exit or stay within a region for a particular amount of time. Leaving the garage? Trigger an action. Entering the basement? Trigger an action. Hanging out in the office? You guessed it, trigger an action. Actions are made up of a few ingredients: the beacon you’re interacting with, the behavior that triggers the action, the schedule of when this action is active and the output produced by the action. Currently, regions are limited to a single beacon. Eventually, you’ll be able to add multiple beacons to the same region for improved accuracy. Until then, actions can only be associated to a single beacon. Triggers are the behavior that cause an action to execute. You can trigger an event upon entering, leaving or staying within a region for a specific amount of time. You’ll have to optimize the distance threshold for each region since a region could “begin” at 2 meters from the beacon or 10 meters from the beacon. Every home and every beacon are different. You interact with your home differently depending on the time of day. Your actions should reflect that. When creating a new action, define a schedule for when that action is allowed to trigger. Don’t want your entertainment center to turn on when you’re doing yoga in the living room at 6am? No problem. Confine your entertainment center actions to the evening. Outputs are where the magic happens. 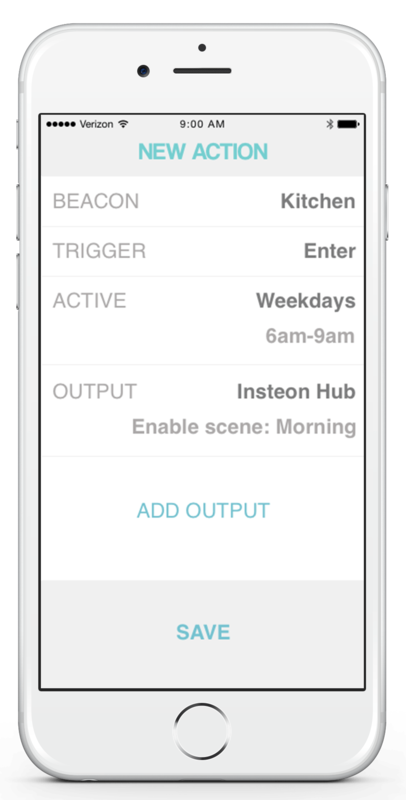 Beacon Action offers integrations with other devices and services you use in your home. The low hanging fruit are devices like Nest thermostats, Hue lights and Insteon products, but the possibilities are endless. One of the more powerful features is the ability to make HTTP requests to any URL, which allows anyone to create their own custom outputs. Is your house filled with smart products that you want to integrate? No problem. Actions can have multiple outputs with separate configurations. Orchestrate as many devices as you need to. We’re looking for smart home enthusiasts who are interested in joining our beta program. Have ideas for integrations and actions? We’d love to hear from you. We’ll be sending out invites and updates in our newsletter, so subscribe below or on our newsletter page. I am currently playing with both, and look forward to your software, as the software piece is definitely lagging the hardware piece. I actually have a good idea for a use case I’d love to share with you, as I would find it very useful and think others would, too. Thanks for the tip, Martin! I’ve seen the XY beacons but haven’t ordered any yet. I’ll get some and update the article. And thanks for the tutorial…I’m sure a lot of readers would gladly get out their soldering irons <$10 beacons. I’m living in the HomeKit world, and I’m wondering if iBeacons like this can be connected to the Home app via the Beacon app. It’d be nice to use iBeacons to trigger HomeKit functions within the Home app. If not, how can that be done? I’m not sure if there’s a great solution for this. Last I checked, the HomeKit API doesn’t allow third-party apps to trigger HomeKit functions unless the app is currently open. There may be some other way to accomplish what you’re after but Beacon Action won’t likely support that for a while.